I recently ordered a NIMA Mitt from the amazing Irish company NIMA Brush . This is a pink Microfiber face cleansing cloth that claims to remove all makeup and dirt from skin using nothing but water! I was completely sold on it after reading Beauty Angels review (here).. 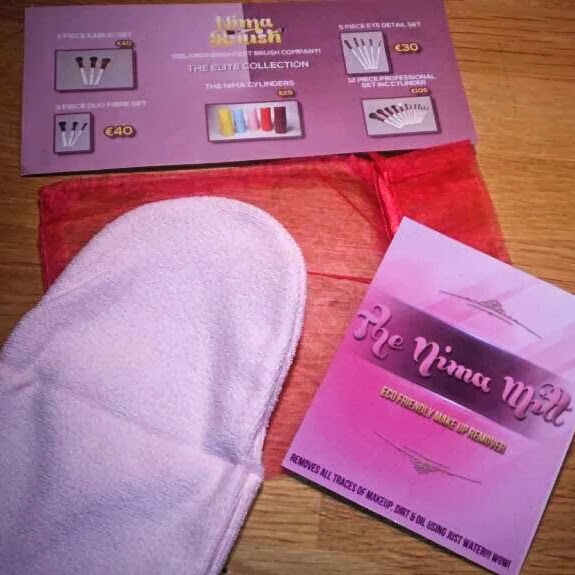 I was wondering if maybe Beauty angel was being overly complimentary but seeing I had done nothing but rave about my NIMA Brushes I thought what the hell - it's only €12.95! And let me tell you I was not disappointed! This unsuspecting pink microfiber mitt is a godsend for removing every scrape of makeup, as well as lightly exfoliating! It's so simple, all you need to do is put on the mitt, run it under warm water and wipe over your face and your makeup simply disappears. This uses NO products or chemicals or oils or anything at all - just water! It removed every scrap of my full face of makeup (including Estee Lauder Double Wear, stubborn gel liner and mascara), it didn't pull at my skin, it didn't leave my face red or tight or with an annoying film of product still on it - it just worked! To clean it you simply wash with a regular bar of soap (bar not liquid), rinse out then hang up by the loop to dry! Simple! After using this for the last week I can safely say my nightly cleansing routine has gotten so much easier and quicker, as well as seeing an improvement in my skin! It's as simple as using a face wipe, but without the awfulness of using one! This mitt is recommended for all skin types, including sensitive. For anyone who may have a particular face wash or something that they need for their skin I'd recommend using the mitt first to remove makeup and dirt, then moving on to your cleanser - you're meant to cleanse twice when wearing makeup anyways and this is a lovely gentle way to start! So ladies and gents, throw out the face wipes because The NIMA Mitt is only €12.95 - here - and is on offer for buy three get one free! Bargain! Great review - the NIMA mitt is so handy, I love mine! GIVEAWAY - WIN A NIMA MITT! !